Need some Dance Floor Wax for your party? 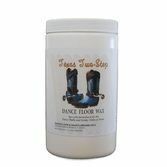 Our Dance Floor Wax will surely help your dance floor have a smooth, gliding surface - just perfect for dancing! Everyone will be rushing to be the first dancer to break the ice.